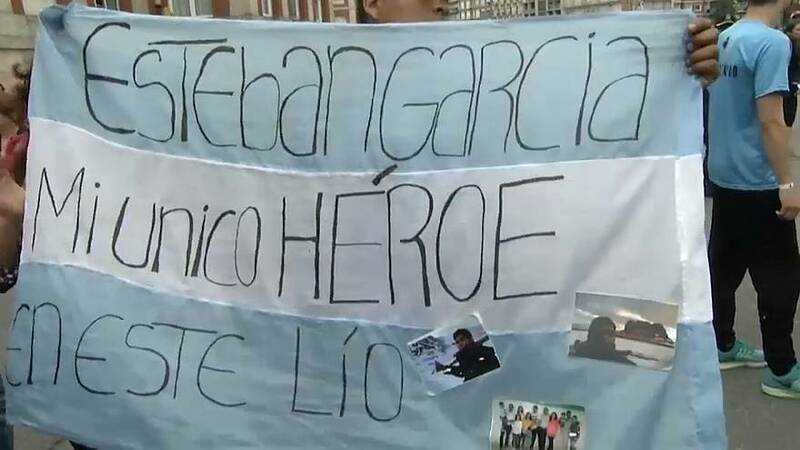 Relatives of the crew aboard a missing Argentine submarine have held a protest match demanding that the navy reverses its decision to stop looking for survivors. Shouting "Search and Rescue" they called for the navy not to give up. Officials have admitted they are still unable to confirm the fate of the 44 crew and no evidence of a shipwreck has been found. "It's because we want them to continue with the search and rescue and we want them here, I have said many times: If they took them, please bring them back." The navy announced it was abandoning hope of finding survivors last week. The news further distressed families who have criticised the Argentine government's response to the tragedy. On Sunday the Navy's spokesperson Enrique Balbi said attempts were still being made to make a visual inspection of another object that registered on a sonar search for remains the submarine. The new object has been detected at a depth of 950 meters. However it is no longer an operation to find survivors. The ARA San Juan last made contact on November 15 when it reported an " electrical breakdown". Hopes of finding survivors faded after a suspected explosion was heard near its last-known location.